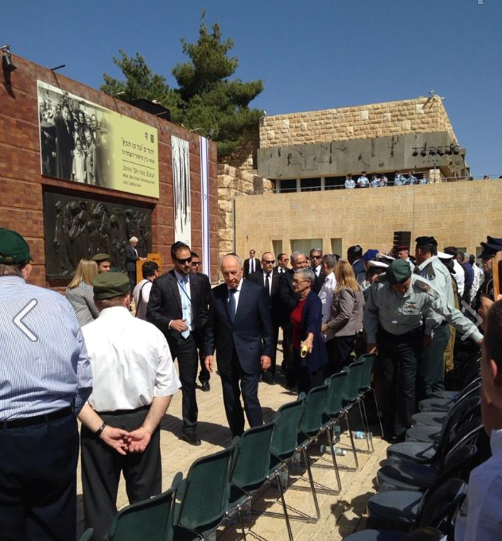 Israeli President Shimon Peres arrives at the Yom HaShoah ceremonies on Monday at Yad Vashem. (Jerusalem, Israel) — Today, I attended more of the Holocaust ceremonies at Yad Vashem. At precisely 10am, sirens rang for several minutes all over Israel and all of us at the event — and all Israelis throughout the country — stood silently for several haunting minutes to remember the six million Jews who were murdered by the Nazis. Here’s a picture of Israeli President Shimon Peres arriving at the event. What a remarkable life. He is 90 today. He was 20 — the age my oldest son, Caleb, is now — when his family was burned to death by the Nazis in a wooden synagogue in Belarus, not far from Minsk, as the Holocaust began. (Minsk is where my father’s family escaped in 1907.) Peres has seen the entire span of modern Israeli history, from the Holocaust to the prophetic re-creation of the State, to all the challenges up and to the present, and been a key player at almost every step along the way. Peres will step down as President this summer. I had the opportunity to meet him in 2005 and interview him briefly, providing material I used in the book, Epicenter. I wasn’t able to talk with him this morning, but I did want to share with you the text of the extraordinary speech he delivered here at Yad Vashem on Sunday evening. Along with the Prime Minister’s speech, I encourage you to read Mr. Peres’ address in its entirely. My brothers and sisters, at this very moment I see before my eyes a heartbreaking image. But then another image comes to my mind. A photo of the town where I was born and spent the first decade of my life. Vishneva. In Vishneva the Nazis used a different technique. They didn’t shoot the Jews. They burnt them alive. The Nazis, Germans and locals, gathered up all the Jews left in Vishneva, (half had already emigrated to Israel) and forced them to march to the synagogue which was made of wood. My grandfather, wrapped in a Jewish prayer shawl, stood at the head of the march, Rabbi Zvi Meltzer may peace be upon his soul. The same prayer shawl that I huddled under every Yom Kippur to listen to him recite the Kol Nidre prayer in his beautiful voice. They locked the doors of the synagogue and set it on fire with all the Jews still inside. No-one survived. Nothing was left of the synagogue. I can still hear the Kol Nidre prayer, which my grandfather would recite, in my heart. I visited Vishneva when I was Foreign Minister of Israel and I was accompanied by the Foreign Minister of Belarus, a delegation of senior government officials, and a honor motorcade. On the way to Vishneva we passed the train station at Bogdanov. The station still operates but during the war years the rails were heaving with carriages packed with Jews on the way to Auschwitz-Birkenau. I imagined hearing the trains. The contradiction between the noise of the motorcade and the screams of help from the trains was ghastly. This station, from which we travelled to Israel, is the station that took my people to the death camps. What happened to them could have happened to me. It could have happened to many of us here tonight. “Saved” wrote Wislawa Szymborska, “because you were first, saved because you were last, because to the left, to the right, because it rained, because a shadow fell.” Everything was by chance. The murdered live in our hearts. Each of us carries in our hearts the grief of his brothers and sisters who perished, like we carry the genius of the creation of Israel. Israel is a monument of grief for their deaths, a monument of genius for their memory, in our homeland. The question still reverberates in our head, which has no answer and which I doubt will ever be answered, “Where were these murderers born? Where were they educated? How did the landscape of cultured Europe transform into a harsh jungle in which wild beasts walked? We know the geographical answer; the human answer does not exist. This year is seventy years since the destruction of Hungarian Jewry. The Nazis invaded on March 19th 1944, a year before the end of the Second World War, and four years before the creation of the State of Israel. They almost immediately set about destroying the Jews. They did it with brutal efficiency. Within a month all the Jews were labeled with yellow stars and concentrated in the ghettos. No-one allowed in, no-one allowed out. The hunger and epidemics preceded the bullets and the gas. Within another month all the rest were sent to the death camps. To Auschwitz-Birkenau. Close to half a million Jews were murdered for no reason. We won’t forget the Hungarian Righteous Among the Gentiles, who risked their lives to save Jewish lives. They are few in number but they carried with courage the image of humanity. The President of Hungary will take part tomorrow in the March of the Living in Poland, a gesture worth of admiration. However, we must not ignore any occurrence of anti-Semitism, any desecration of a synagogue, any tomb stone smashed in a cemetery in which our families are buried. We must not ignore the rise of extreme right wing parties with neo-Nazi tendencies who are a danger to each of us and a threat to every nation. The State of Israel of today is not only the only possible memorial standing for our perished brothers and sisters. Israel is a deterrence against any attempt at another Holocaust. A strong Israel is our response to the horrors of anti-Semitism but it does not excuse the rest of the world from its responsibility to prevent this disease from returning to their own homes. Allow me to say, based on 90 years of experience, that without a state of our own we would continue to live on our weakness rather than, as we do today, live on our historic and contemporary abilities. The State of Israel is not a passing event; it is based upon 4000 years of life. 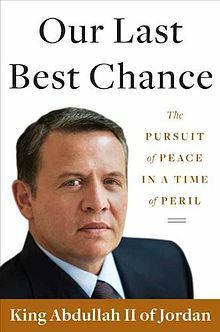 The history of the Jewish people contains no lack of anguish but it is filled with hope – the eternity of Israel will not lie. Israel seeks peace. Between people and between nations. Peace with nations near and far. We pursue peace because we pursue justice for all regardless of origin, regardless of faith. The right to peace is the right to life. I say with confidence – we are strong enough to repel dangers, we should not be scared of threats and we must not give up on peace. As a member of the Jewish people I may not and I cannot forget the horrors of the Holocaust. As a citizen of Israel I will do everything in my power to ensure that the Nazis will not rise again. As a human being I will do everything in my power to bring peace between peoples. Between races. Between religions. Between nations. We lost the best of our parents and the best of our children. But our faith that victories are temporary and values are eternal never erred. We will forever be a people who believe in values of man and values of heaven. In the name of the six million, among them one and a half million children, we will carry the torch of Jewish independence. The torch of freedom. The light of man. The belief that we will know an enlightened world in which every person treats the other as a fellow human being. And in which we are all born in the image of the Lord. May their memories be blessed. 85% of Americans concerned young people don’t know enough about Holocaust or learning lessons of how to confront evil, finds new poll. What can you do to teach your children? As readers of this blog know, this has been a theme of many of my books over the years. Yet recently we learned a fascinating piece of data. A surprisingly large majority of the U.S. population is concerned that Americans are not being taught enough about the Holocaust or learning how to confront evil in our time. They are especially concerned that young people aren’t being effectively taught what can happen when evil rises and we do not take decisive action to stop it. These are among the findings of an exclusive new poll Tyndale House Publishers and I commissioned as we prepared to release The Auschwitz Escape. It seems particularly relevant to highlight such findings on Holocaust Remembrance Day. Let us consider, therefore, how we can do a better job reaching all Americans — and especially young people – with the history and lessons of the Holocaust. After all, darkness is falling. We are facing rising evil all over the world and Americans are going to have to make hard choices very soon on how to deal with such evil. One of the main reasons I wrote The Auschwitz Escape was to do my small part to educate myself, and my family, and others, about the horrors of the Holocaust, but also about some of the remarkable true stories of Jews and Christians who helped each other to fight the Nazis and rescue as many lives as possible. Start following the U.S. Holocaust Museum and Yad Vashem on Facebook and Twitter and share/re-Tweet what they publish to others. Give to organizations that are caring for Holocaust survivors — The Joshua Fund is one such organization. May God bless you as you do your part to learn the lessons of the Holocaust, share those lessons with others (especially young people), and take direct and specific actions to care for Holocaust survivors, as well as those who are suffering other global traumas, including genocide. >> Learn more about the true stories of four remarkable heroes that really did escape the Nazi death camp at Auschwitz in the spring of 1994 to tell the world the truth about what Hitler was doing to the Jewish people. 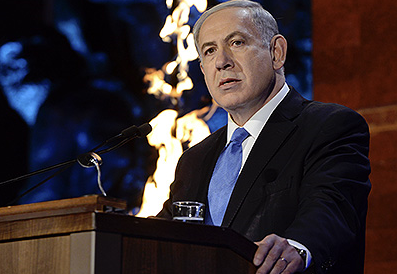 PM Netanyahu speaking at Yad Vashem tonight. (Jerusalem, Israel) — What a tremendous honor to attend the opening ceremonies of “Yom HaShoah,” Holocaust Remembrance Day, at Yad Vashem this evening. It was my first time to participate in this annual event, and I was repeatedly moved to tears. I was moved by Israeli President Shimon Peres’ speech, as he shared personal stories of his family being burned to death by the Nazis in a wooden synagogue in Minsk (the same city my father’s Jewish family escaped from in the early 1900s). I was moved by the Prime Minister’s address, as he raised some very challenging questions, and warned the world is in danger of making the same mistakes as in the 1930s. 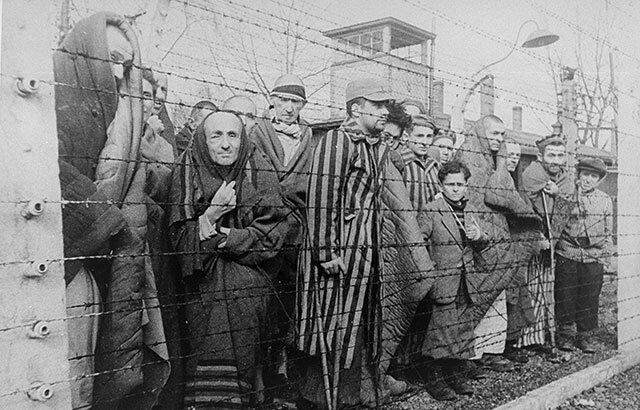 As I wrote about in The Auschwitz Escape, 1944 was the pivotal year in the Holocaust. The Nazis were murdering millions of Jews, but the Allied were liberating more and more of Europe. Then Vrba, Wetzler, Rosin and Mordowicz escaped and told the world the truth about the “Final Solution.” It was a race against time. Would Hitler succeed in killing all of Europe’s Jews? Or would Roosevelt and Churchill succeed in defeating the Third Reich, saving the Jewish people, and setting all of Europe and the world free from this horrific evil? As it is late here in the epicenter, I will post my personal comments and observations on the evening at a later time. For now, let me simply provide a few excerpts from Prime Minister Netanyahu’s powerful keynote address, which anchored the evening. Let me also provide the link to the English text of the full address (though it was delivered in Hebrew). Please take the time to read the full speech. It is as moving as it is timely. Abbas: Holocaust ‘most heinous crime’ in modern era (Jerusalem Post) — PA President Mahmoud Abbas extends first official condolences in special statement issued on Holocaust Remembrance Day. WHY DID WORLD LEADERS & JEWISH LEADERS FAIL TO DETECT THE COMING HOLOCAUST IN TIME? During the 1930’s, when the Nazis were gaining momentum, the influence of the trauma of the First World War was still fresh. Twenty years earlier, the people of the West experienced a terrible trench war, a war which claimed the lives of 16 million people. Therefore, the leaders of the West operated on the basis of one axiom: avoid another confrontation at any cost, and thus they laid the foundation for the most terrible war in human history. This axiom of avoiding conflict at any cost, this axiom was adopted not only by the leaders. The people themselves, primarily the educated ones, shared it too…. Today, just like then, there are those who dismiss Iran’s extreme rhetoric as one that serves domestic purposes. Today, just like then, there are those who view Iran’s nuclear ambitions as the result of the natural will of a proud nation – a will that should be accepted. And just like then, those who make such claims are deluding themselves. They are making an historic mistake. Holocaust Remembrance Day: Here are four true heroes to remember. (Jerusalem, Israel) — Those who forget the past are doomed to repeat it, said Santayana. Indeed, let us never forget. Yom HaShoah begins on Sunday evening, April 27th. Today, we remember the six million Jews that were murdered by the Nazis, including 1.5 million children. Today, we honor their memories, and pledge ourselves never to forget them. Today, we devote ourselves to making sure such evil is never allowed to happen again. This is not just a day for Jews. This is a day for the whole world to remember. This evening, I will attend the Holocaust Remembrance Day ceremony at Yad Vashem, Israel’s renowned Holocaust memorial and research center. It is my first time being invited, and I am deeply honored to be able to participate. After the event, I will Tweet updates, and then post more on this blog, so you can track what is happening and consider its significance. Over the next few days, I will also attend additional events and ceremonies with Holocaust survivors and scholars, Israeli leaders, and various Jewish and Christian leaders. I am very much looking forward to this, especially because several of the scholars here were enormously helpful as I was researching my new book. Indeed, I am planning to bring copies as gifts for the men and women who were so generous with their time and insights. Recently, FoxNews.com published a column I wrote giving their names and sketching out their dramatic stories. I hope you’ll take a moment to read the whole column, and then share it with others. Thanks so much. May more such heroes rise up in our generation. They pulled off the greatest escape in human history – from a Nazi death camp – to tell the world the truth about Hitler, but no few know their names. Today, we face dangerous new threats from Iran, North Korea, and a rising czar in Russia, not from Germany. Yet curiously, in recent weeks Israeli Prime Minister Benjamin Netanyahu, former Secretary of State Hillary Clinton, and House Majority Leader Eric Cantor have each warned that as we confront current challenges we must be careful to learn the lessons of history regarding how the world failed to understand the threat posed by Hitler and the Nazis and deal with it decisively, before events spun out of control. To commemorate the 70th anniversary of these escapes, and to draw attention to the significance these unknown – or unremembered – events, and the lessons they have to teach us, I recently wrote a work of historical fiction, “The Auschwitz Escape.” I changed the names of key figures involved so as not to put words in their mouths that cannot be verified to be their own. But it is my deepest hope that the book will cause many to dig into the real history of these remarkable heroes. Rudolf Vrba and Alfred Wetzler were Slovak Jews. They escaped from Auschwitz on April 7, 1944. Arnost Rosin was also a Slovak Jew. Czeslaw Mordowicz was a Polish Jew. Together they escaped from Auschwitz on May 27, 1944. Upon making it safely to Czechoslovakia…. 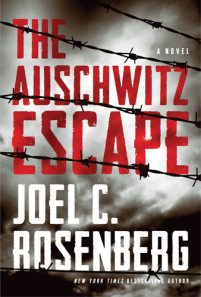 The Auschwitz Escape debuts at #11 on the New York Times hardcover fiction bestseller list. The Auschwitz Escape hits #7 on Publishers Weekly hardcover fiction best-seller list. Sean Hannity has invited me to be on his nationally syndicated radio show today. We’ll be discussing the latest events in Ukraine, including the growing anti-Semitism there. We’ll also discuss The Auschwitz Escape. I don’t have an exact time yet, but will keep you updated via Twitter. Please join us if you can. Thanks. 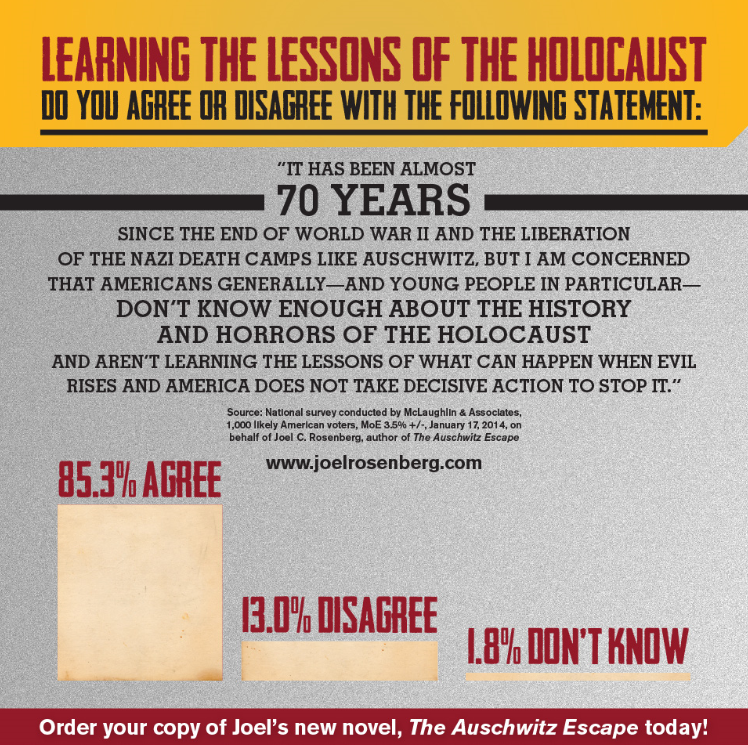 “The Auschwitz Escape” now 4th week on New York Times best-seller list. Thank you. Thank you all so much for the continued support and enthusiasm you’ve shown for The Auschwitz Escape. We’ve just learned it will remain on the New York Times’ hardcover fiction best-seller list for the fourth week in a row. The first two weeks it was #11. The last two weeks it has been #20. I’m deeply grateful for all of you who have talked about the book with friends, and have written reviews of the book on Amazon, Barnes & Noble, other book sites, on Facebook, your blogs, Twitter, and other social media. If you haven’t done so yet, please feel free to post a review on our “Epicenter Team” page on Facebook. I love to get your feedback. My family and I are humbled by the interest in this new novel — and the true stories that inspired the book — and your encouraging reactions. God bless you! We so appreciate your support. Hebrew University scholar says “third day” resurrection a Jewish concept that pre-dates Jesus. What does the Scriptural & archaeological evidence say? Today is Easter, and some two billion Christians around the world are celebrating the resurrection of Jesus Christ. But did the Jews of Jesus’ time really believe the Messiah would one day come to earth, die as a “suffering servant” as an atonement for sins and the redemption of Israel, and rise from the dead on the third day? A respected professor and Dead Sea Scrolls expert at Hebrew University says the death and “third day” resurrection of the Messiah is, in fact, a distinctly Jewish concept that pre-dates Jesus. Dr. Israel Knohl has based on his conclusions on many years of research and recently analyzed archaeological evidence, including a previously unstudied Dead Sea Scroll. Indeed, Knohl argues that this notion of the Messiah rising on the third day is a pre-Christian concept that dates back to before the birth of Jesus in Bethlehem Ephratah. I had the opportunity to sit and discuss this with Dr. Knohl at length last summer and it was an absolutely fascinating conversation. I first heard of him when he drew worldwide media attention several years ago for his research, including a major article in the New York Times and several articles in Biblical Archaeology Review — see here, and here, and here. The tablet has been named by scholars as “Gabriel’s Revelation” because it suggests that the angel Gabriel was instructed by God to direct that the Messiah be raised from the dead on the third day. The stone tablet was discovered about fifteen years ago and is owned by a Israeli-Swiss Jewish man by the name of David Jeselsohn who didn’t understand its significance when he purchased it. The Times article was published in 2008. Dr. Knohl then published a book about all this in 2009 entitled, Messiahs and Resurrection in “The Gabriel Revelation.” That was a follow up to his previous book, The Messiah Before Jesus: The Suffering Servant of the Dead Sea Scrolls (first published in Hebrew in 2000 and then in English in 2002). 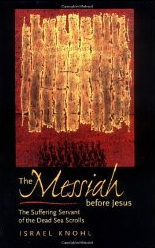 In the book, Dr. Knohl explains the various Jewish theories about the Messiah, including the idea of a “Messiah son of David” who will be a reigning king on the earth like King David was, and a “Messiah son of Joseph” who will be rejected by his brothers, mistreated, left for dead but will eventually reappear and save not only the nation of Israel but the world like Joseph did in the book of Genesis. As an evangelical Christian from a Jewish heritage (my father is Jewish, my mother is Gentile), this subject fascinates me and my family. We studied how the Hebrew Scriptures speak of the Messiah suffering and dying to atone for our sins and how we see these ancient prophecies described in Isaiah 53, in Daniel 9:26 (which says the Messiah will come for atonement, then be “cut off,” and afterwards Jerusalem and the Temple will be destroyed), and Psalm 22. We also looked carefully at the Gospel accounts to show how Jesus remarkably fulfilled each of these prophecies. Then I read excerpts of the Times story to Lynn and the boys, and we discussed why many Jewish people think the idea of a suffering Messiah who dies and rises again on the third day is a Christian idea, when really it is a Jewish idea, as explained with such intriguing research by Dr. Knohl. I would commend these articles — and his books — to your attention. Read them yourself. Study and discuss them with family and friends. What if the Gospel story is true? What if Jesus not only died for our sins but was buried and raised from the dead on the third day, according to the ancient Hebrew prophecies? Please click here for a simple, concise summary of the Gospel message, and a clear explanation of how best to respond. 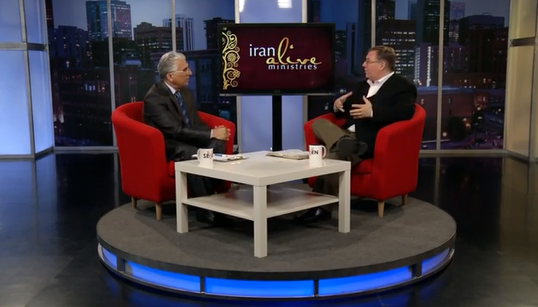 Hormoz Shariat, the “Billy Graham of Iran,” and I discuss the Gospel — the good news of how Muslims, Jews, and all people can be forgiven and go to heaven — on live satellite TV broadcast into Iran. (Washington, D.C.) — In 1979, there were fewer than 500 Muslim converts to Christianity in all of Iran. Today, there are over one million Iranian who love Jesus Christ, have become His followers, and are celebrating Easter. In fact, this Easter millions of former Muslims throughout the Middle East, North Africa and central Asia are celebrating the death and resurrection of Jesus Christ. Whereas they once saw Jesus as merely a prophet, now they are convinced that He is God, and they have renounced Islam and chosen to follow Him no matter what it costs them. In my 2009 non-fiction book, Inside The Revolution, I wrote several chapters about this extraordinary trend of Muslims leaving Islam and becoming Christ-followers. In the book, I described my travels from Morocco to Afghanistan, interviewing “MBBs,” Muslim Background Believers in Jesus. One of the leaders of this movement that I profiled in the book is Dr. Hormoz Shariat. He was a Shia Muslim in Iran in 1979 shouting, “Death to America!” on the streets of Tehran with his Muslim wife. But within a few years, they were actually living in the U.S. and had both become Christians after dramatic conversion experiences. They started sharing the Gospel with friends and leading them to Christ. In time, they started planting churches of Iranian believers, and eventually founded a satellite TV ministry to broadcast the Gospel and discipleship training into Iran and the Persian speaking world. In the book, I dubbed Hormoz “the Billy Graham of Iran,” because God has raised him up to preach the Gospel to millions in their native language of Farsi. Now, a Christian magazine has just profiled Hormoz. I was interviewed for the article and was honored to discuss my friendship and respect for him. I commend the article to your attention and encourage you not only to read it in full, but to share it with others. Please be praying for Hormoz and his family and team, as well as for all MBBs this Easter season. They face intense spiritual opposition, and persecution. But they have see the great hope and freedom and forgiveness and peace that comes from faith in the Lord Jesus Christ, and most are eager to share the good news of God’s amazing grace and love with the Muslim world, regardless of the challenges and dangers they face. In the three decades since Shariat set his resolve, this minister—dubbed “the Billy Graham of Iran” by New York Times best-selling author Joel C. Rosenberg—has not only watched that goal come to fruition, but has also been given a front-row seat to one of the most astonishing supernatural phenomenon in modern times: thousands of people in Iran and throughout the Middle East reporting visitations of Jesus in dreams and visions. Since the hostage crisis ended in 1981, Rosenberg says the number of Christians in Iran has increased exponentially, from 500 to a conservative estimate of 1 million. Shariat, however, says the number may be far larger, noting that Iran—the world’s only theocracy, with 76 million residents—has the fastest-growing evangelical Christian population on the planet, according to the latest edition of Operation World’s manual. In fact, more Persians have come to Christ in the 35 years since the Islamic Revolution than in the prior 1,400 years combined—and most of these conversions have occurred in the past decade, as an estimated 62 million Iranians have gained access to the gospel message through satellite TV broadcasts…. >> An historic Christian awakening is under way in Iran. I discuss the inside story in this 20 minute interview with Dr. Hormoz Shariat. (Washington, D.C.) — There is a deeply disturbing article in the USA Today that I encourage you to read and share with others. It reports that leaflets are being spread throughout the eastern Ukrainian city of Donetsk saying that government officials controlled by pro-Russian forces are ordering Jews to register with local authorities and pay a fee, or they could be deported and their assets could be confiscated. Secretary of State John Kerry today called such actions “intolerable” and “grotesque.” But pro-Russian separatists flatly deny the allegations that they have been distributing leaflets requiring Jews to register. The leaflets exist. They’ve been spread all over the city of Donetsk. They’re even printed on official government stationary and they bear the signature of the mayor. But the mayor says he didn’t write it. So who did? Are they a hoax, or official policy? One thing is clear: someone is targeting the Jewish people of Ukraine, trying to instill fear in them, and trying to get them to leave the country. That said, given the long history of virulent anti-Semitism in the region, there is reason to be concerned for the safety of the roughly 200,000 Jewish people in Ukraine. As I write about in The Auschwitz Escape, Adolf Hitler made similar legal moves against the Jewish people in the early 1930s, separating them out from the rest of the population. We know where it led — the Final Solution and the gas chambers a few years later. We cannot yet say where the leaders of Donetsk are going with this, but clearly such moves bode ill. Please pray for the Jewish people in Crimea and throughout Ukraine, for safety and protection and for the Lord to truly bless them amidst this crisis and beyond. Please also pray for Israeli leaders and other Jewish leaders as they determine how to respond to these developments, should they prove to be true. Is it possible that soon Israel will have to begin airlifting Jews out of Ukraine? If that happens, the Christian community must stand with the Jewish people and help in every way. Jews in the eastern Ukrainian city of Donetsk where pro-Russian militants have taken over government buildings were told they have to “register” with the Ukrainians who are trying to make the city become part of Russia, according to Israeli media. Donetsk is the site of an “anti-terrorist” operation by the Ukraine government, which has moved military columns into the region to force out militants who are demanding a referendum be held on joining Russia. The leaflets bore the name of Denis Pushilin, who identified himself as chairman of “Donetsk’s temporary government,” and were distributed near the Donetsk synagogue and other areas, according to the report. Pushilin acknowledged the flyers were distributed by his organization but he disavowed their content, according to the web site Jews of Kiev, Ynet reported. Emanuel Shechter, in Israel, told Ynet his friends in Donetsk sent him a copy of the leaflet through social media. “They told me that masked men were waiting for Jewish people after the Passover eve prayer, handed them the flyer and told them to obey its instructions,” he said. Consequences for non-compliance will result in citizenship bein g revoked “and you will be forced outside the country with a confiscation of property.” A registration fee of $50 would be required, it said. “We don’t know if these notifications were distributed by pro-Russian activists or someone else, but it’s serious that it exists,” she said. “The text reminds of the fascists in 1941,” she said referring to the Nazis who occupied Ukraine during World War II. Michael Salberg, director of the international affairs at the New York City-based Anti-Defamation League, said it’s unclear if the leaflets were issued by the pro-Russian leadership or a splinter group operating within the pro-Russian camp. But the Russian side has used the sceptre of anti-Semitism in a cynical manner since anti-government protests began in Kiev that resulted in the ousting of Ukraine’s pro-Russian former president Viktor Yanukovych. Russia and its allies in Ukraine issued multiple stories about the the threat posed to Jews by Ukraine’s new pro-Western government in Kiev, Salberg said. Those stories were based in part on ultra-nationalists who joined the Maidan protests, and the inclusion of the ultra-nationalist Svoboda party in Ukraine’s new interim government. But the threat turned out to be false, he said. Svoboda’s leadership needs to be monitored, but so far it has refrained from anti-Semitic statements since joining the government, he said. And the prevalence of anti-Semitic acts has not changed since before the Maidan protests, according to the ADL and the Ukrainian Helsinki Human Rights Union, which monitors human rights in Ukraine. Distributing such leaflets is a recruitment tool to appeal to the xenophobic fears of the majority, to enlist them to your cause and focus on a common enemy, the Jews,” Salberg said. And by targeting Donetsk’s Jews, they also send a message to all the region’s residents, Salberg said.